The constellation Draco winds between the Big and Little Dippers in the far-northern sky. 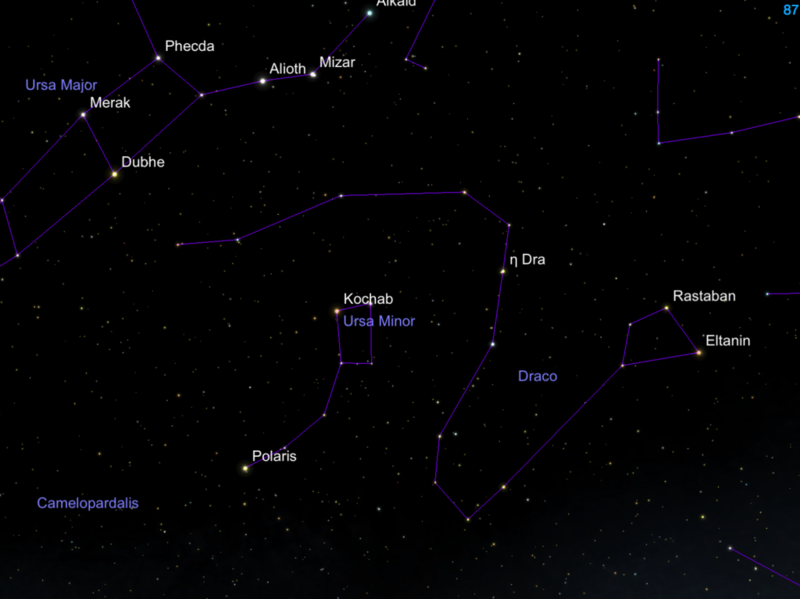 Now we look to the long and winding constellation Draco. This group winds between the Big and Little Dippers. The tip of its tail lies just above the bowl of the Big Dipper, while the small quadrilateral of its head lies near one of the feet of Hercules. The constellation is well overhead from March through the late months of summer in the northern hemisphere. Which is fitting, since Draco is linked with the myth of the Twelve Labors of Heracles (the Greek name for Hercules). In the myth, Draco represents the dragon Ladon, which guarded the golden apples in the gardens of the Hesperides, the daughters of the Titan Atlas. The golden apple tree was given as a wedding present to Hera when she married Zeus. Hera placed Ladon around the tree so the Hesperides would not pick its apples. So as part of his Labors, Heracles was asked to pick golden apples from the tree. He killed Ladon with poisoned arrows and took the apples. Saddened by the dragon’s death, Hera placed him in the sky. Draco is usually depicted coiled around the North Pole, with one foot of Heracles on its head. The stars of the constellation Draco. The Romans had a different story in which Draco was one of the Giant Titans who battled with the Olympian gods for ten years. Draco was killed in battle by the goddess Minerva and placed into the sky, where it froze around the North Pole. To follow Draco, find the tip of the tail marked by the red-orange M-type Giausar (“JAW-sahr”) by following the star Merak through Dubhe (in the bowl of the Big Dippter) about a distance equal to the spacing between these two stars. Then follow the body of Draco to Thuban, to Edasich (“ED-a-sik”) , then to a series of stars under the bowl of the Little Dipper. The head of the beast consists of the stars Grumium, Eltanin (γ Draconis), Rastaban (β Draconis), and ν (nu) Draconis. The orange K-type star Eltanin is the brightest star in the constellation, but Thuban is the most famous. It was once the North Star from around 2,800 B.C. to 1,900 B.C. As the Earth’s axis slowly precessed, the north celestial pole moved closer to Kochab in Ursa Minor and, in time, to Polaris.